Visitors to Roula Partheniou’s exhibit Cup and Ball in Toronto first encounter a hill of what look like Dixie cups, arranged in a tidy grid of undulating stacks. Near the top of Toronto's First Canadian Place, the country's tallest office tower and Bank of Montreal's global operational HQ, there's a little-known exhibition space. At the end of a hallway lined with gems from the BMO corporate art collection, tucked between a meeting room and a business centre, it's a sliver of a gallery – big enough for a photocopier, a few filing cabinets and a vending machine, maybe. But, annually, the space hosts a year-long project by one of Canada's top contemporary talents. The public is welcome to visit, though viewings are booked by appointment only. The BMO Project Room began in 2009 with the work of Vancouver-based artist Adad Hannah, who built a video installation riffing on a famous optical illusion by illustrator Charles Allan Gilbert picturing a woman gazing into her vanity mirror. The artworks that appear there from January to November each year are original commissions. Participation is by invitation and the artist retains ownership of the work afterward. Alongside its acquisition program, which has collected some 7,500 pieces for display in offices worldwide, and its annual contest for postsecondary artists, BMO 1st Art!, the Project Room is another means for the bank to support emerging, established and senior artists across a wide range of media, curator Dawn Cain explains. It has shown some of Canada's most-celebrated mid-career art-makers, including Shary Boyle, Myfanwy MacLeod and Micah Lexier. In 2015, Kent Monkman turned it into a hospital room specialized in treating the afflictions of modern art. For 2016, Montreal artist Michel de Broin constructed a machine that perpetually builds, destroys, then rebuilds sandcastles. Three of its commissions have been purchased by the National Gallery of Canada. For its 10th edition, opened just last week, the 2018 BMO Project Room features the artwork of Toronto sculptor Roula Partheniou. Framed by the doorway, visitors first encounter a hill of what look like Dixie cups, arranged in a tidy grid of undulating stacks (doubling the glass and concrete stacks that appear everywhere outside the window). It is a compelling formalist and minimal sculpture, not unlike the cumulative installations of American artist Tara Donovan, Partheniou notes. Stepping into the room, visitors then find a large pail heaping full of Ping-Pong balls, and their interpretation begins to shift. Now, it's a challenge posed to the viewer: Get the ball in the cup, a very familiar sort of game. The prize wall is an eruption of colour. A tower of frisbees, foam hands, giant tubs of Dubble Bubble, pink popcorn, cartons of Milk Duds, a fishbowl full of bouncy balls and lollipops are fanned out in a tantalizing array. Making another quarter spin away from the spectacular westward view, turning instead fully toward the interior wall, the hermeneutic dance steps Partheniou has choreographed lead visitors to a final reveal: the prize wall. In contrast to the monochrome room, it is an eruption of colour. A tower of frisbees, foam hands, giant tubs of Dubble Bubble, pink popcorn, cartons of Milk Duds, a fishbowl full of bouncy balls and lollipops fanned out in a tantalizing array. 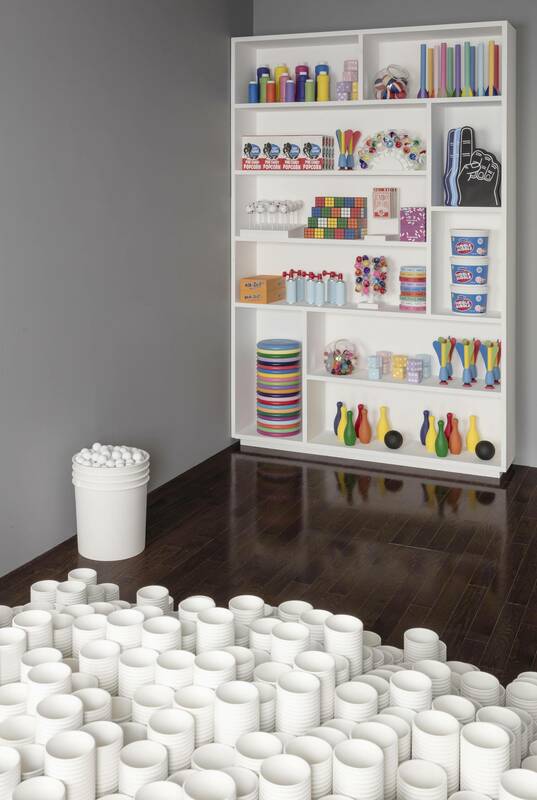 The display is composed meticulously and with eerie perfection, as if merchandised by Sol LeWitt. When Partheniou was a teenager, between the ages of 14 and 16, she worked at a Niagara Falls amusement park in the midway. "I remember feeling like I was in on the scam," she says. The ring-toss rings were barely large enough to fit around a bottle neck. She was taught how to stack the tin cans so that a baseball would almost never be able to knock them from the table. The ordinariness of the objects made the games seem simple and surmountable. But that ordinariness also hid their trap. The same grift underlies her art-making practice. The games were all rigged. And so, too, are her artworks. 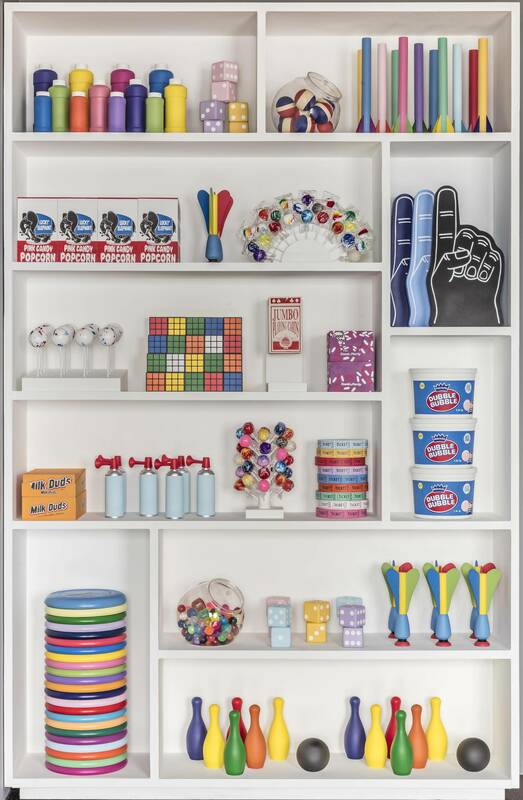 Everything that appears in the room – the foam dice, the bottles of blowing bubbles, even the stacks of cups – are replicas fashioned from wood and resin and acrylic paint. She painstakingly reproduces the aesthetics of mass production by hand. To tip viewers off, the objects display varying degrees of verisimilitude. The blowhorns, for example, are reduced to simpler shapes, while the ICEE cup, which appears startlingly as litter on the window sill, is a hi-fi knockoff. You'll find other tiny clues in a typographical inconsistency – say, in the numbering on a roll of tickets or maybe evidence of a brushstroke on the surface of a foam hand. Partheniou is trying to elicit a double take. "Where you situate yourself somewhere between what you see and what you thought you knew," she explains. Deception isn't her end game; rather, she wants to make palpable the processes of perception. "It happens in a matter of seconds, but they're a very slow few seconds," she says. "All of a sudden there are these feelings of disorientation and uncertainty about what you're looking at. And in that moment, you're in this in-between cognitive space where you're repositioning yourself." In slowing down those synapses, she puts focus on the acts of seeing and reading our environment. For that pregnant moment just before the mind has found its footing, the scene – with all its lexical elements – is full of possibility. This is perhaps her biggest trick: In a room with a view that stretches kilometres, Cup and Ball challenges the visitors' view to shrink. To win at Partheniou's game of skill, you must mind the smallest details. To visit Cup and Ball, on view at the BMO Project Room in First Canadian Place through Nov. 30, go to cupandball.ca.